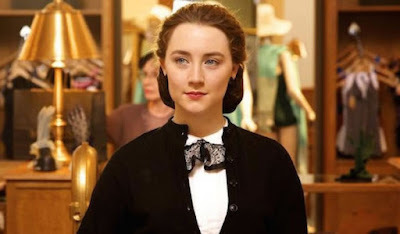 Early in “Brooklyn”, when teenage Eilis Lacey (Saoirse Ronan) is still in Ireland, she attends a local dance with her best friend who hopes against hope that a handsome young boy will ask her to dance. He does, and as they move off to the dance floor, the camera ignores them, remaining fixated on Eilis, who watches her friend with a sad smile and then…looks away. Ronan doesn’t do a lot with her face in this moment, because she’s intelligent enough to know on the screen you don’t have to, but she lets the melancholy fade, procuring instead a kind of quiet dignity. She’s on her own now, about to depart for America, and the scenes that follow, tearful waving goodbye aboard an ocean liner and the ensuing trans-Atlantic journey, all standard issue, can’t compete with this single close-up. Though “Brooklyn” encompasses so many miles, introducing a myriad of characters along the way, its story is nonetheless intimate, one of a young girl – nay, woman – forging a new home even while grappling with the knowledge that she will always come from somewhere else. For all the sorrow and hardship that typically goes hand in hand with an immigrant’s plight, director John Crowley’s adaptation of a Colm Tóibín novel, keeps firmly to the sunny side of the street, so much that I kept hoping for a cutaway shot of Marion Cotillard’s Immigrant on the other side of the street, watching in distress, weeping, crying out, “Why am I not in that movie? !” It’s telling that in Tóibín chose to set his book in the 1950’s rather than a hundred years earlier in the midst of a wave of Irish immigration during the great famine. This isn’t a story of extravagant impoverishment and a necessity to leave but of wanting to leave, of striking out for another place in the face of limited opportunities and want of something more. In Brooklyn, a kindly Catholic priest (Jim Broadbent) lines up a boarding house where Eilis stays and procures her a department store job while paying for accounting classes at night. It all seems so easy that you might wonder why every person in Eilis's village doesn’t light out for America. Homesickness is a bugaboo, yes, and she has to cope with this polite version of the rat race, sure, but drama is fairly subdued, more prone to pop up in the form of learning to eat spaghetti without splattering sauce. 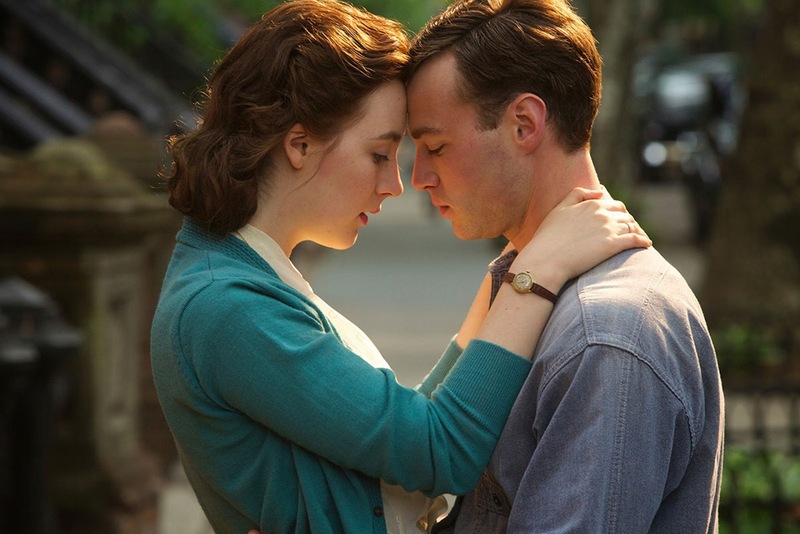 Heck, it hardly takes any effort to meet a handsome Italian boy named Tony (Emory Cohen), one so sweet he even stifles his Brooklyn Dodgers’ obsession for a good long while, fearing she’ll dismiss him as one of those guys. They may be of differing nationalities but that’s neither here nor there; their love affair is hardly fraught, it’s a fairytale. Still, Ronan makes for a convincing Cinderella. This easily could have played as Girl Figures Out Life Once She Meets Boy, but it doesn’t. Ronan allows her character ownership of the situation, growing into herself the more she gets to know him, wary but curious. This blossoming is mirrored in Eisile’s wardrobe, one which turns more colorful and à la mode without going overboard, emblematic of her entire arc, as she grows in truthful increments rather than artificial leaps and bounds, the narrative refreshingly remaining understated. At least, that is, until Eilis is summoned back to Ireland when her sister passes away. These sequences are intended to demonstrate the pull our native home always holds over us, and that sensation is there to a degree, yet nearly every story element upon Eilis’s return to her village seems fashioned to keep her there. It’s as if the entire town is in on some plot to which she and we are not privy, like the sequence at the end of “Funny Farm” has suddenly been transposed across the ocean, so effective are the spate of coincidences – from landing a job in one swift stroke to meeting a young man (Domhnall Gleeson) who appears as the other only one for her. And for a good while you’re fearful that tipping the scales so predominantly in this portion of the film will remove the climax from Eilis’s hands, particularly when she’s confronted by her old spinster boss regarding a potential secret. Not so fast. In that incredible sequence, Ronan’s blue eyes practically burns a hole through the screen as Eilis re-claims the identity she has worked the whole movie to cultivate, not about to let anyone make the most crucial choice for her. It’s not that you can’t go home again; it’s more about realizing that, hey, as it turns out, I’m already home because this new place...this is my home. This is an era-specific movie but that’s a timeless message, one the film is more than willing to simply let rise intrinsically rather than shamelessly peddling. And in a shot of Eilis near the end, seen from across the street, coolly leaning against a brick wall, she looks so poised and grown up, you momentarily feel like a parent, bidding adieu, weepy-eyed but secure in the knowledge that she’ll be all right.